It doesn't seem possible that Cam's hip dislocation surgery was more than 18 months ago. The hardware embedded has been a part of his healing process. Like all other challenges, he has sported a good attitude and positive outlook throughout. We scheduled the hardware removal surgery two days before Thanksgiving, knowing he would miss only one day of school. The surgeon had told us from the beginning the hardware would only serve the purpose of keeping everything in place while it fused together. Since Cam is still growing, it isn't possible to remain there. An early Tuesday morning arrival at 6am kicked us off as we awaited Cam's expected 7:30am surgical entrance. We were happy to hear things were running on schedule and our brave boy indicated he was fine to go into the surgery room by himself, without his parents. A big step for a kid who has had either Mom or Dad with him each time he's gone under anesthesia. All went well and we were home late that afternoon. A delicious edible arrangement arrived from Auntie Jo and buddy Will just in time to perk us all up. Many thanks for the healthy, sweet treat! 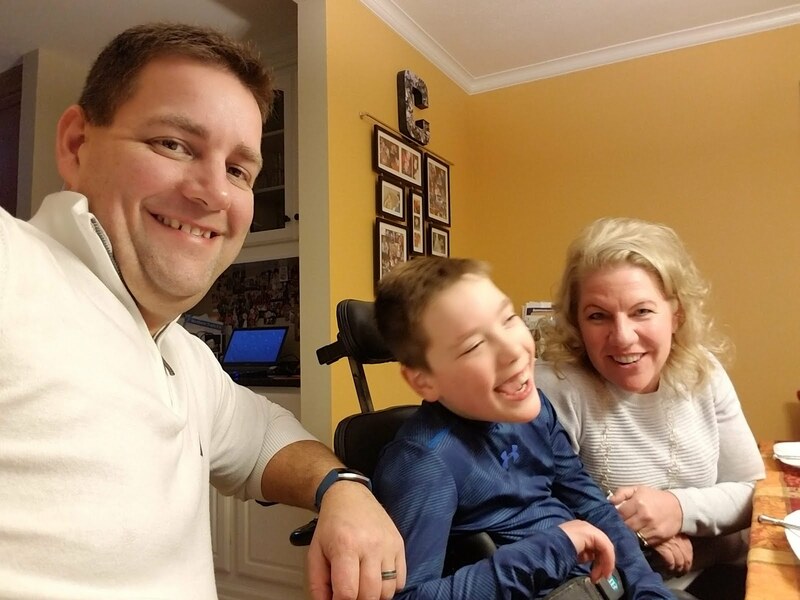 This recovery for Cam proved so much easier than the first go around and on Thanksgiving Day, he was ready for a turkey feast! The morning began with Opa and his grandson making the delicious homemade stuffing, as they do each year together. Chris and Cam had reserved a 23-lb turkey from a local farm store to be stuffed. One might wonder if we had any leftovers with 6 people at dinner...well, yes, we actually did. Oma and Opa as well as Ms. Ann were present at our table of thankfulness. We picked up this turkey decoration complete with paper feathers to write on. Cam, with Oma's help, filled out many of them before dinner was ready. A collaborative effort brought us an enormous stuffed turkey, mashed and sweet potatoes, green bean casserole, homemade cranberry relish and homemade gravy, as well as crescent rolls. After dinner, we were all so full, we opted to delay dessert by an hour. Ms. Ann made pumpkin pie and Oma brought her apple pie. Each of us had to try a sampling of both. Chris opted for a little extra whipped cream on his sweet treats. We talk about thankfulness quite a bit with Cam and how important it is to thank others. It truly is a gift that costs nothing but has a lasting impact. Surrounded by our family and friends (we refer to as our family) is the perfect way to celebrate the harvest festival. On Friday, we finished decorating the tree with Oma and braved an outing with Cam late in the afternoon to the outlet mall. Our 11-year-old was a trooper and for his first official field trip since surgery he made it through with flying colors. Oma, Cam and his mom promptly rewarded themselves with a sweet hot chocolate drink after our single store purchases. Getting through the store was a faster excursion than our exit off of the highway. We said goodbye to Cam's grandparents on Saturday, most thankful for their time and company. We dined on breakfast for dinner with our Raisch family on Sunday enjoying delicious homemade pancakes and all of the fixings. We met Sarah's friend, Ryan, for the first time and he graciously offered to take an aerial shot of our dining experience. A big thumbs up from our crew. There is so much and so many to be thankful for. As JFK once said:"As we express our gratitude, we must never forget that the highest appreciation is not to utter words, but to live by them." 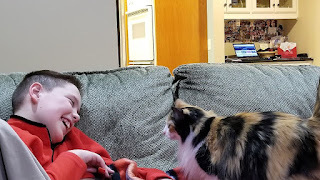 Cam and our cat, Stella share a pretty special relationship. Stella was a part of our home one year before Cam. When Cam arrived, she watched over him, protecting him. As some would say, like a lioness protecting her cub, with a growl to match. Cam spent a few days on the couch after surgery, stretching his legs. Stella needed a closer look. "It's alright, Stella. I'm okay, don't worry."